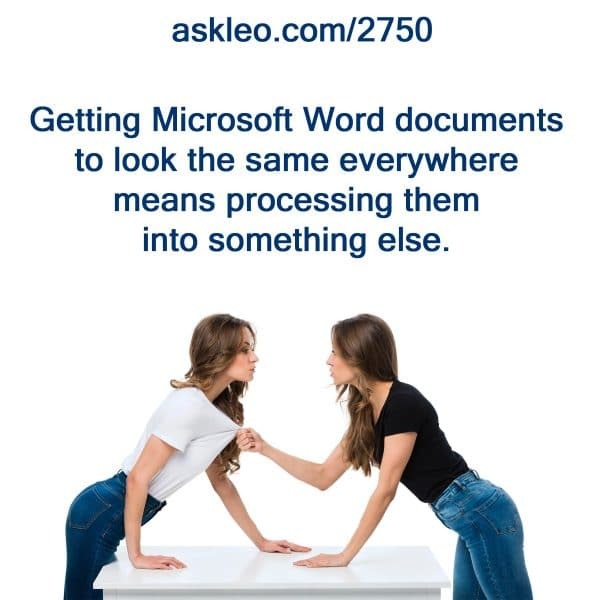 Getting Microsoft Word documents to look the same everywhere means processing them into something else. - Ask Leo! How Do I Turn Off Automatic Formatting in Microsoft Word? - Microsoft Word tries to be helpful and format items based on what it thinks you're doing. That's handy, if it's what you want. If not, it's annoying. What the CCleaner Hack Means to You - CCleaner, a popular Windows utility, accidentally included malware in its download for a time. Here's my take on what to be concerned about and what to do. « Previous post: Phishing is epidemic. Legitimate-looking emails asking for sensitive information are often bogus.